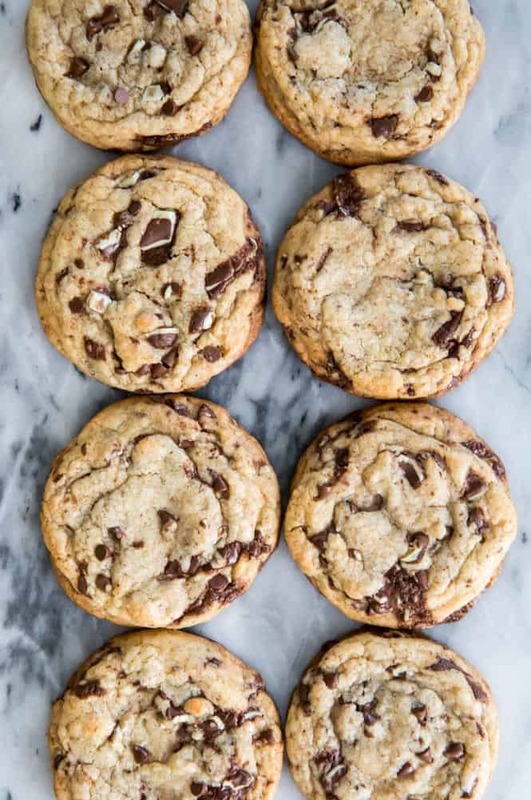 Mint Chocolate Chip Cookies! 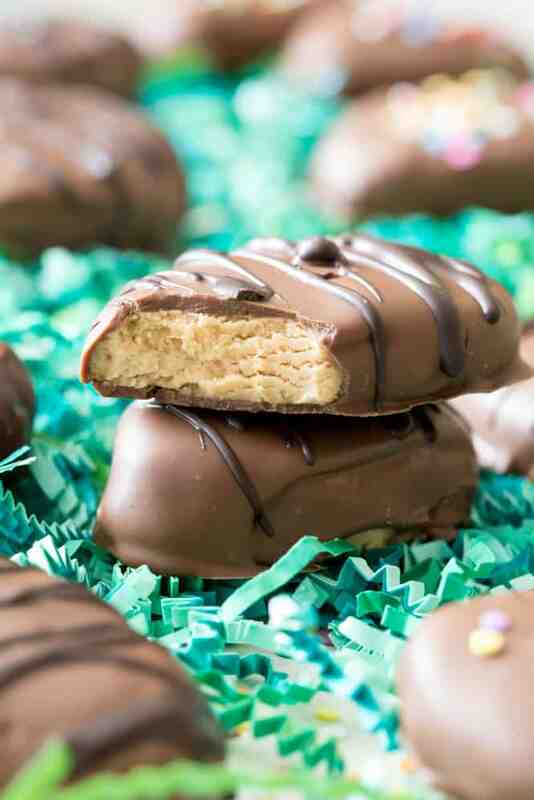 Chewy, buttery cookies loaded with mint chocolate candy pieces. This simple cookie recipe is made easy with no mixer required! With St. Patrick’s Day right around the corner, I had the idea to share something a little green and somewhat festive in celebration. So I got to work on a mint chocolate chip cookie recipe, one that used green (and brown) Andes candy pieces (because, yum) and a buttery cookie base. It took a few attempts for me to get the cookie base just right, but once I did I was so excited about the outcome. 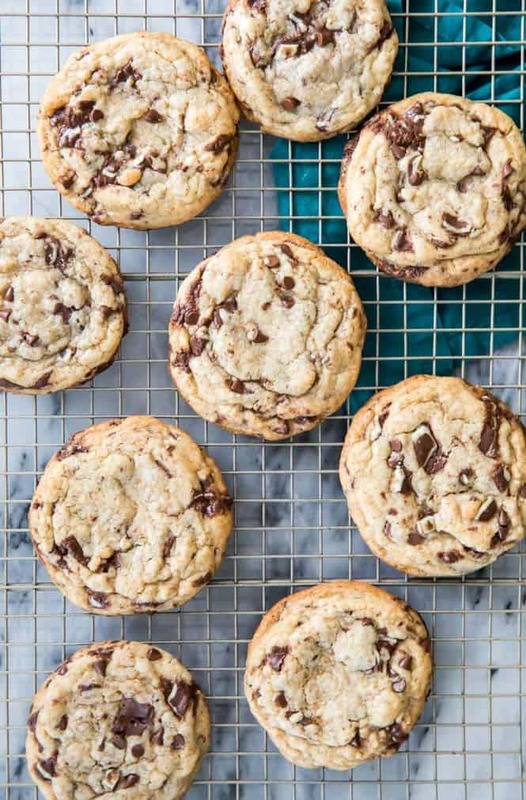 These cookies are soft, flavorful, and chewy. The mint flavor is present without being overwhelming (I hate toothpaste-tasting desserts!). Perfection. Except… once I went to edit my photos, I had to admit to myself that they fell a little short on both the green and the festive front. The green mint color from the candies is, admittedly, barely noticeable, and maybe these could even pass for traditional chocolate chip cookies (at least until you take your first bite). So maybe these mint chocolate chip cookies don’t scream St. Patrick’s Day. Maybe there is a glaring lack of shamrocks (though you could always add shamrock sprinkles or green nonpareils), but they’re still pretty darn good cookies, and they’re perfect for any time of the year. If you’ve made any of my other cookie recipes, you’ll probably recognize a lot of these tips. Still, they’re worth repeating. Melt your butter, but let it cool. 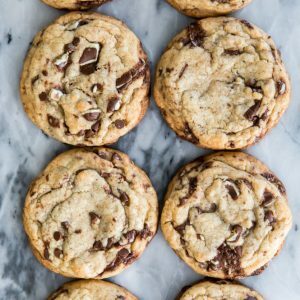 I’ve found that melting your butter rather than creaming it with your sugar tends to result in softer, chewier cookies with a better butter flavor. And when you melt your butter you can easily stir your cookies together by hand, no mixer necessary. However, it’s so important that you don’t add sugar to your butter when it’s too hot or you run the risk of melting the sugar. Unfortunately, this will result in an unsalvageable, runny cookie dough that will spread all over your baking sheet. To make sure you don’t melt your sugar, let your butter cool at least 10-15 minutes or until no longer warm to the touch. Ugh, I hear you. Chilling cookie dough is a pain, especially when you’re hungry and want those cookies now. But it’s important. I promise, I wouldn’t make you do it unless it was important. 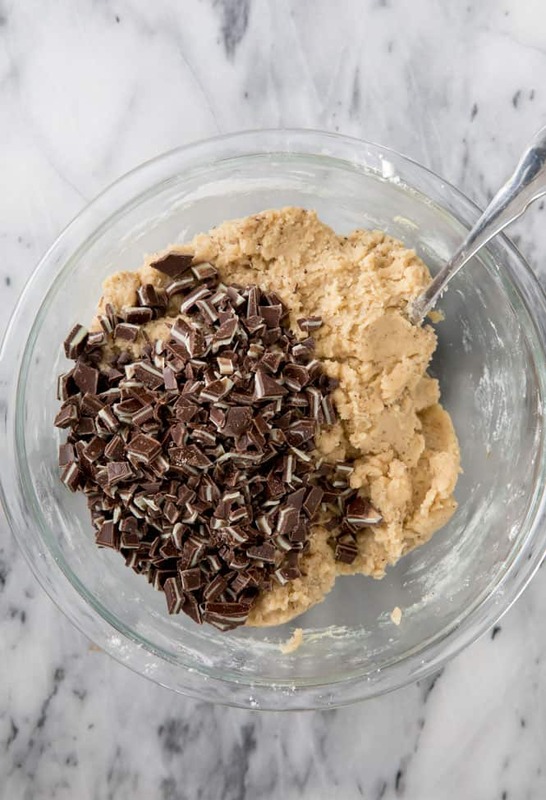 Because we’ve melted our butter (remember, that’s going to give us chewy, flavorful mint chocolate chip cookies) it’s important to chill the dough so our cookies don’t spread too much. Chilling the dough also helps the flavor to develop. I recommend a minimum of 30 minutes in the fridge, but you can chill this dough (covered) for up to a week. I used Andes brand mint chocolate candy pieces to make these cookies. My grocery store used to sell pre-chopped up candy pieces that would have been perfect and convenient for these cookies, but I’m not sure that they make them anymore (if you can find them, feel free to save yourself some effort and use them, though!). Instead, I simply chopped up 1 package worth of Andes candies. One package or 28 candies will give you a heaping cup of mint chocolate candy, which is exactly how much you need for this recipe. You can substitute mint chocolate chips if you prefer, but you may need to use more than a cup. 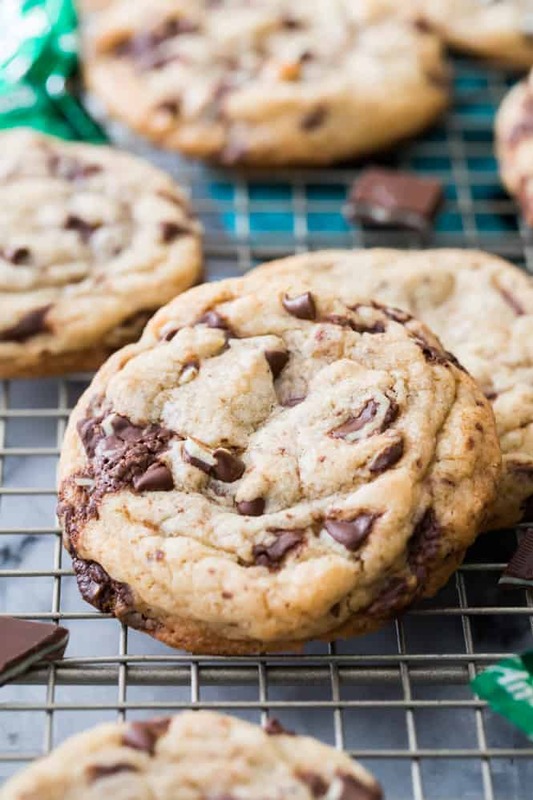 Mint Chocolate Chip Cookies! Chewy, buttery cookies loaded with mint chocolate candy pieces made easy with no mixer required! These are festive for St. Patrick's Day but perfect for any time of the year! Combine melted, cooled butter, brown sugar, and granulated sugar in a large bowl and stir until well-combined. Stir in eggs and vanilla extract. Set aside. 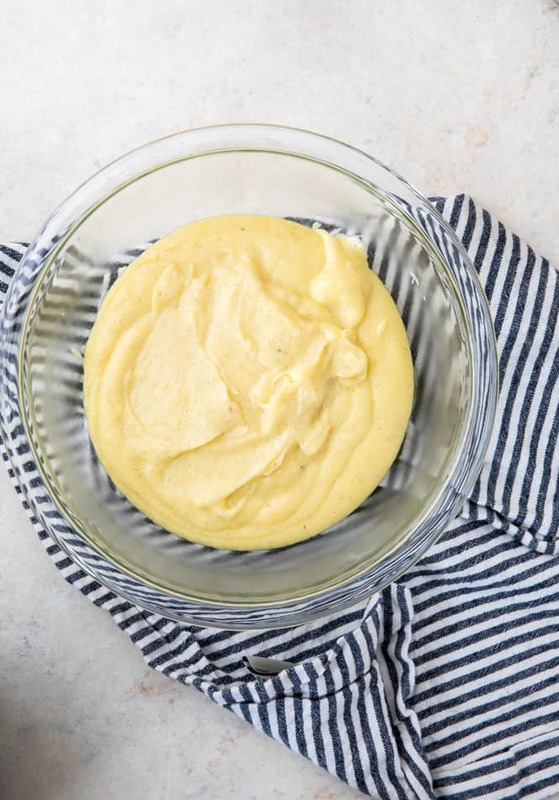 In a separate bowl, whisk together flour, cornstarch, baking soda, baking powder, and salt. 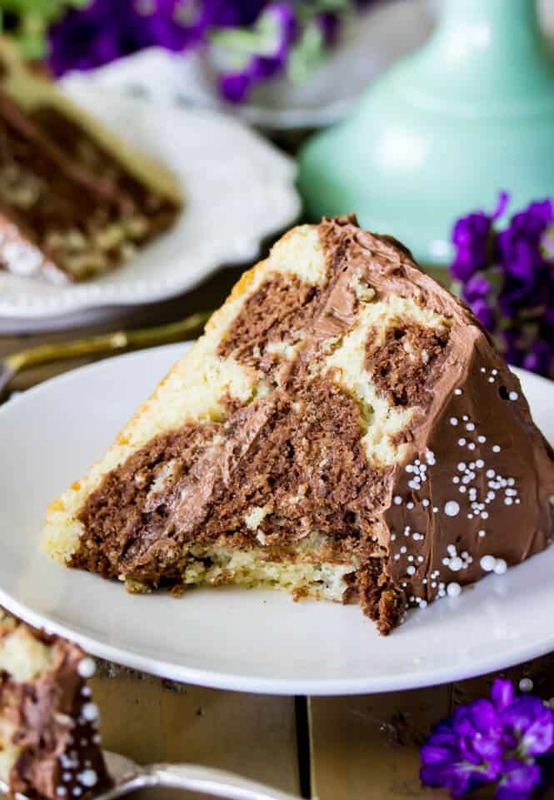 Add mint chocolate candy pieces and mini chocolate chips and sir well. Cover bowl with plastic wrap and refrigerate for at least 30-60 minutes. 15 minutes before you're ready to begin baking your cookies, preheat oven to 350F (175C). 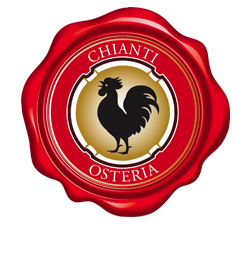 Remove cookie dough from refrigerator and scoop dough by heaping 1 1/2 Tablespoon-sized balls and drop onto parchment paper lined baking sheet². I like to roll the dough between my palms to get uniform, round cookies but you do not have to. Space cookie dough at least 2" apart on baking sheet. Transfer to 350F (175C) preheated oven and bake cookies 12 minutes or until edges are light golden brown The centers of the cookies may still seem a little underdone but allow the cookies to cool completely on the baking sheet. They'll finish baking there and this is key to keeping them nice and soft. 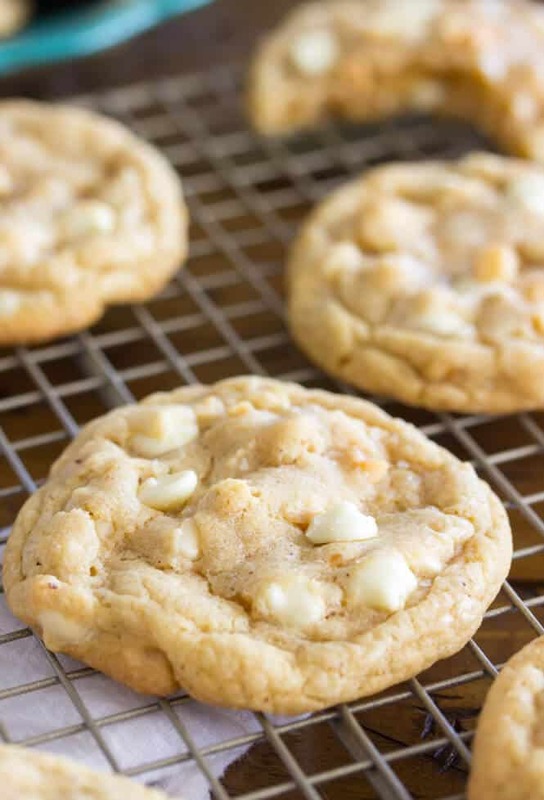 ¹The butter should not be hot to the touch or it could melt your sugar and then your cookie dough will be runny and will spread all over your baking sheet ²If you don't have parchment, just bake directly on an ungreased cookie sheet.